I love making this colorful roasted red pepper soup on cold winter day - it's nourishing flavor and simple steps make it a weeknight go-to. Because red peppers aren’t in season, I use jarred roasted red peppers, which are a super convenient pantry ingredient. Fresh carrots, fresh fennel, and thyme round out the tangy flavor of the peppers. 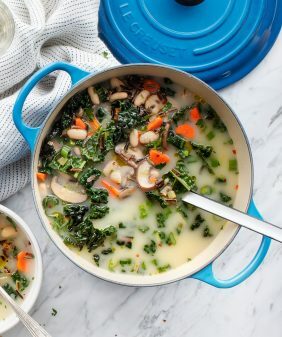 Cannellini beans add creaminess to the soup without adding cream or nuts. 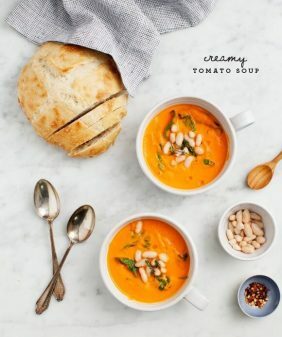 This roasted red pepper soup recipe is an old favorite – it’s on page 203 of our first cookbook which (shameless plug!) makes a great gift. I made just a few tweaks to the original recipe, which are listed below. As a contrast to the smooth texture of this soup, I added chopped roasted red peppers and extra herbs. It’s a small detail, but the chunky diced peppers give it a nice texture. Give it a whirl, then, voila… you have creamy orange-red Christmas soup (or soup for whatever holiday you celebrate). 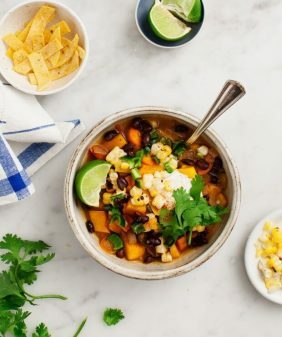 Like most soups, you can make it ahead and keep it in the fridge for a few days – the flavors just get better and better. It also freezes well. 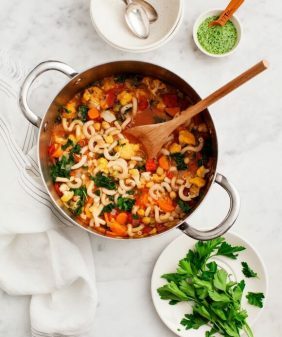 If you’re craving more soup, go browse more soups in the soup section of our recipe index! 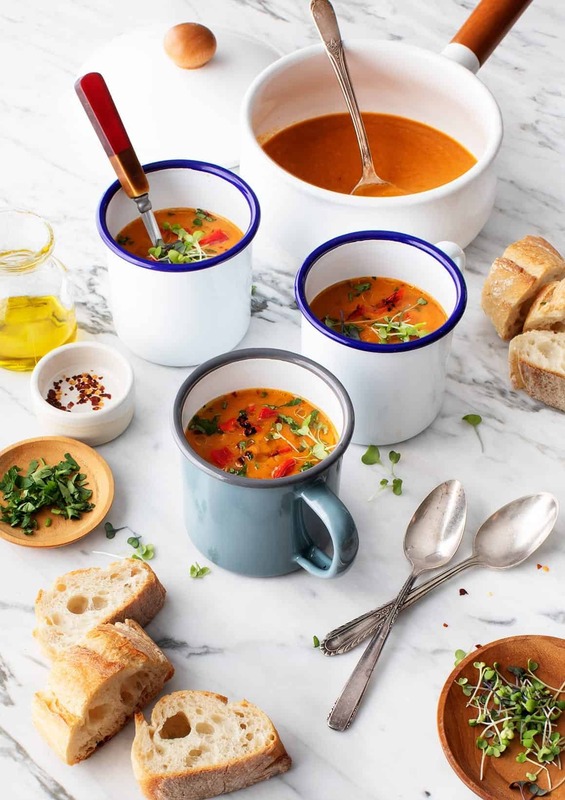 This vegan roasted red pepper soup is a light, nourishing winter meal. Great for weeknight dinners or packing up for lunch. Heat the olive oil in a large pot over medium heat. Add the onion and pinches of salt and pepper and cook until translucent, about 5 minutes. Add the garlic, fennel, carrots, and thyme leaves. Stir and cook until the carrots begin to soften, about 10 minutes. 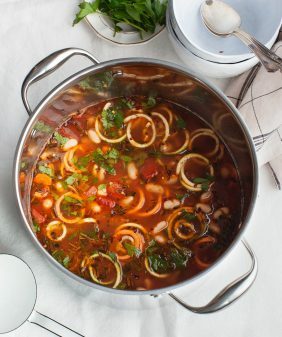 Add the balsamic vinegar, red peppers, beans, tomato paste, broth, and ½ teaspoon salt. Simmer until the carrots are tender, 15 to 20 minutes. Add the simmered soup to a high-speed blender and puree until smooth. Season with more salt and pepper, to taste. If you would like more punch, add a few more drops of balsamic, to taste. If you would like a little heat, add ½ teaspoon red pepper flakes. Serve with generous drizzles of olive oil (do not skip, this really makes the soup more luscious and flavorful), desired garnishes, and warm baguette. Can I skip or substitute fresh fennel? 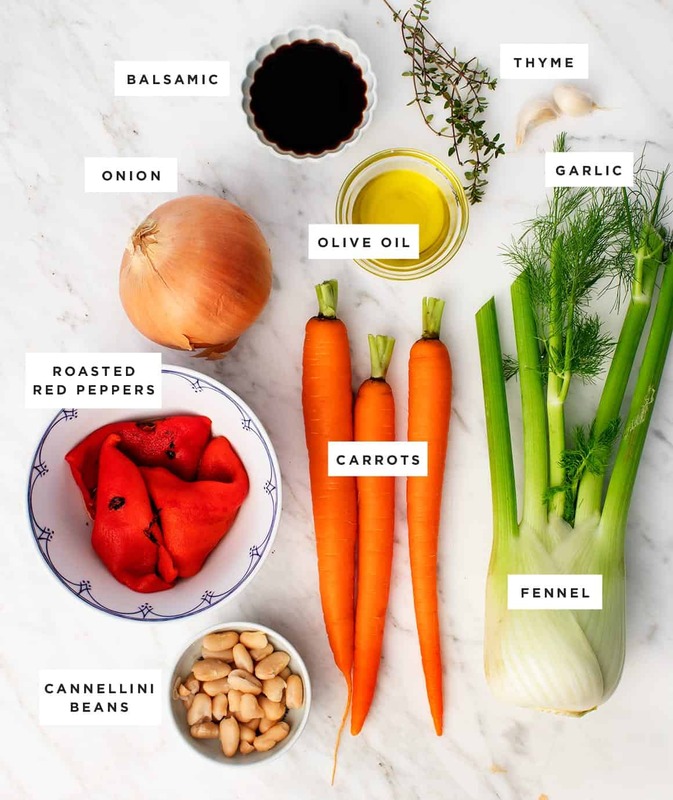 Hi Jill, I haven’t made this specific recipe without the fennel – it’s so delicious, there’s not a strong fennel flavor, I recommend giving it a try! Hi Roxane, I used 365 brand vegetable broth that is salted. You can add salt to your liking, but I found that the 1/2 teaspoon salt was the perfect amount of seasoning. I think the tomato paste balances the red pepper flavor nicely, so I prefer this soup with it, but you can taste it before you add it if you like. Thanks, I am sure it will taste better using the paste and perhaps that small of an amount won’t cause me problems. Probably will do what you suggest and taste it before adding. Probably the hardest part for me of having to go to a low acid diet to manage GERD (medications didn’t work and had too many side effects) was eliminating tomatoes and tomato products from my diet. So funny you posted this today… after browsing through your book on a very rainy day yesterday, my boyfriend and I decided to try this recipe. We added a pinch of red pepper flakes at the end and then topped it with some Gruyere. We’ll definitely be making this again, thanks! You said first cookbook in the post…does that mean you guys are working on another one? Ha, I really let that one slip out, good catch :). 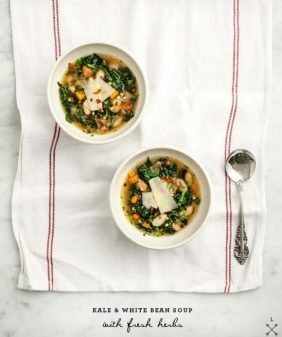 Mmmm, can’t wait to add this to my soup season rotation! Do you think I could use fresh red peppers instead of jarred? If so, how many do you think I need? Yep, you can roast fresh red peppers (blister them, cover in a bowl for 10 or so minutes, then peel the skins). I would use the same amount. Hope that helps! So would that be three roasted bell peppers or three jars of roasted bell peppers? I was going to use fresh peppers but wasn’t sure exactly how many I should use. Yes, use 3 small red peppers for the soup (plus a 4th if you would like diced roasted red pepper as a garnish). The jarred red peppers are kind of small, so if your peppers are very large, you could use 3 total instead of 4 total. I always like cheese to go in or on the side of my soup. Is there a cheese you would recommend to go with this? Thank you! It looks so yummy and perfect for the weather! Another reader said she topped hers with gruyere cheese and I really love that idea. Hope you enjoy the soup! Hi, do your jarred red peppers contain vinegar in the liquid they’re preserved in? The ones I have in my pantry contain white vinegar and I don’t know if they will be good. Hi Natalia, the ingredients on mine are: water, sea salt, and citric acid (These are the ones I get: https://amzn.to/2C8X52l). If they’re preserved in vinegar, it will change the flavor of the soup, I can’t say how exactly without trying it myself. You could try using them and omitting the balsamic vinegar from the recipe. Or you could add the balsamic at the end, just to taste, if you feel like the soup needs more zing. Hope that helps! It sounds like they’ll work just fine! Super delicious and healthy recipe – absolutely loved it, as did the bf! Made a huge pot-ful and had leftovers for a couple of days. The perfect antidote to cold winter evenings. Thanks for another delicious and beautiful recipe! Was delicious! I might’ve added more beans than the recipe called for; I used the entire 10.5 oz can. Made for a nice, hearty soup, perfect with a grilled cheese panini. This soup was seriously excellent! I had to chop my veggies a little smaller so I could use an immersion blender, but it was well worth the extra effort. This will be going in the regular soup roation for sure. I guess I’ll be the one raining on this parade. I cook with my nose, and as I was proceeding, no flavors were hitting by step 4. It looks like the fennel, carrot and peppers are canceling each other. I found the soup bland and the best call of it was the microgreens. This said, I’ll try again with another twist to give it a smoky depth. Thank you. sorry you didn’t love this one, I like the balance, but I could see a more bold/smoky direction being delicious.